Whatta day. Whatta month! We’re feeling very exhausted–mentally and physically–but are happy to be where we are. 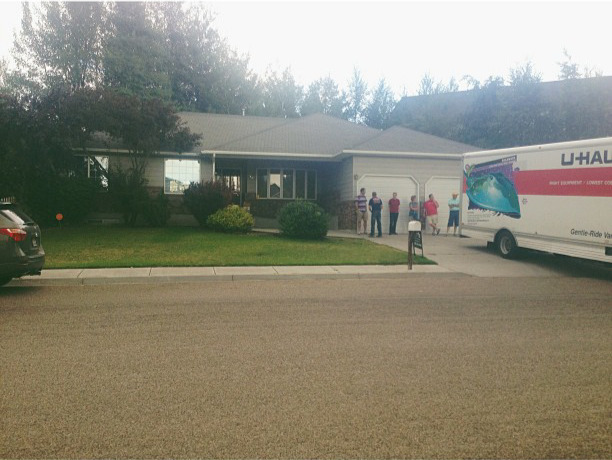 Monday we closed on our Utah home and signed it over to its new owners, and yesterday we made the 4.5 hour drive to our new town and moved all of our stuff into our new home, with the help of some family members (yay for living close to family!!) and new neighbors. We actually aren’t going to start residing here until early next week when we finalize the closing, but we were able to strike a deal with the previous owners that allowed us to move our belongings in early since the house was vacant and we were newly homeless. Every time we walk through our new house, we get even more excited about its potential. 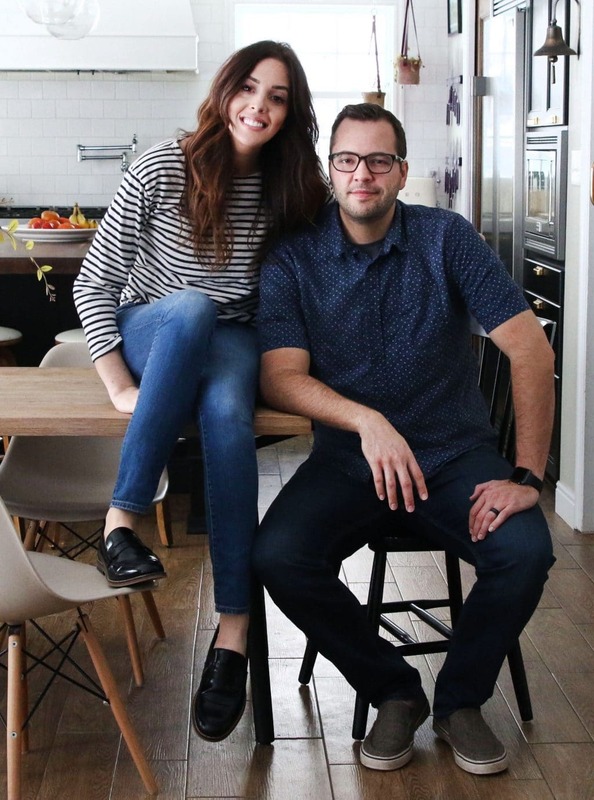 The house was built in 1992 and is 3412 square feet–a lot larger than I ever wanted to try to maintain but the layout, neighborhood and equity potential won us over. It is a rambler, meaning you walk in on the main floor and there is a staircase leading to a finished basement–each floor being just over 1700 square feet. Today, we’ll just share photos of the main floor and cover the basement in another post. 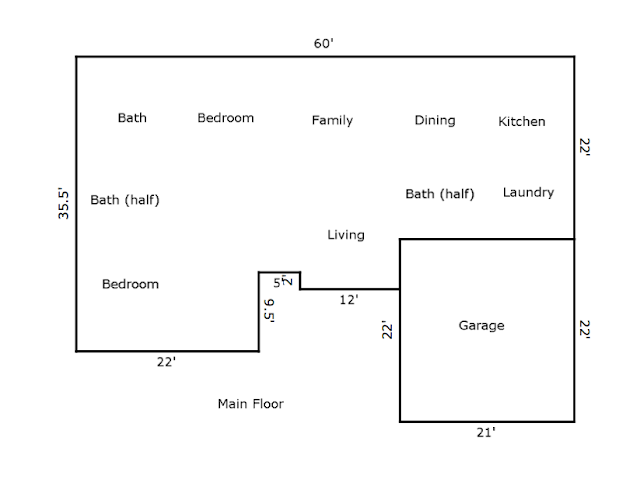 And also, I owe you a better floor plan, but this is the one that the appraiser drew up for us to give you an idea of how things are laid out. Let’s dive in! Note: we’ll share plans for each space in a different post. Let’s think of this as room introductions only. 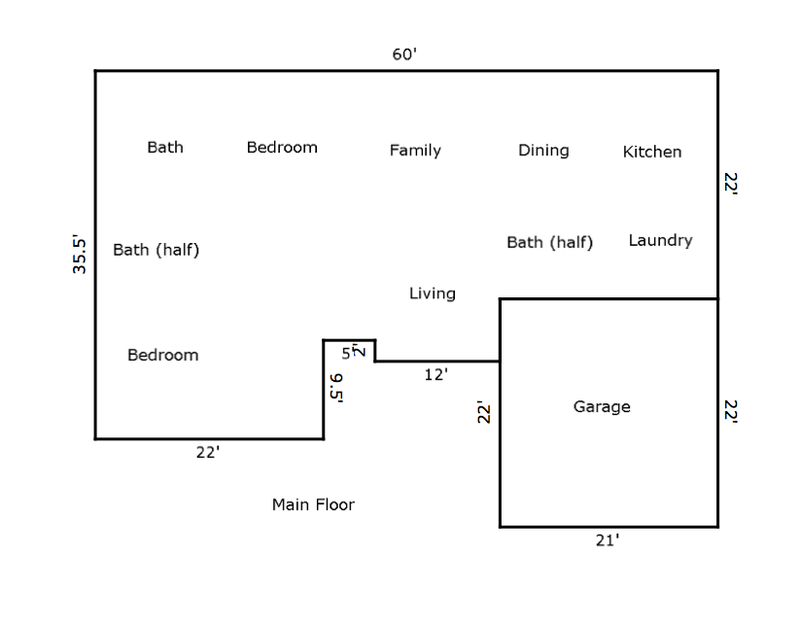 As you walk in the front door, you see what we’ll be using as a living room right in front of you (labeled as “family” on the floor plan). I know that tile in a living space is pretty common in tropical settings, but in Idaho? Not really necessary. To the right (marked “living” on floor plan) is what we’ll be using as a library/reading room. It’s a small room with amazing windows and natural light. Can you just imagine a Christmas tree in front of those window in a couple months?! Back to the great room–our living room/dining room/kitchen. It’s about 33 feet long and it took me a bit to wrap my head around. I think the tile flooring threw me for a loop. I just didn’t see living room, but once we lay wood floors throughout this entire floor (numero uno on our list), it will really transform things I think. The layout of the kitchen, particularly the island and pantry, is interesting–but we’re excited about the potential here more than anywhere. 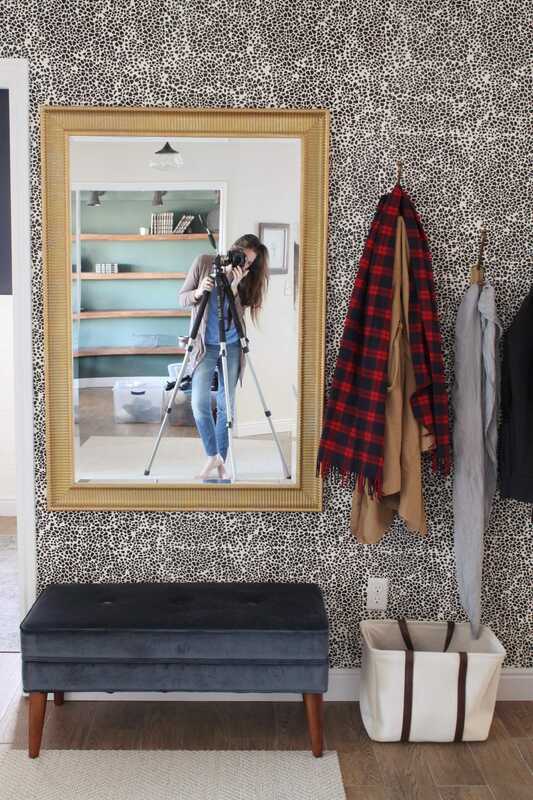 That’s a big mirror on the wall on the right and it is very attached to the wall. The ray of sunshine in the kitchen is definitely these corner windows. Here’s the view from the kitchen into the dining room and living room area. And to the left there is a doorway that leads to a laundry room, garage, and half bathroom. All of the cabinetry in the laundry room (and a countertop!) are great perks. There is also a closet that they added shelves to and took out the hanging rod, which we’ll definitely reverse because we definitely need a coat closet. Opposite the laundry room is that half bath. Pretty basic. Another stuck mirror to the right and forward is another half bath. And to the right are double doors (!!) leading to the master. The master bath is large, but definitely could be optimized. The last room on this level is the fifth bedroom, but we’ll use it as an office. There’s no closet in here and the baseboards are minuscule, but that window is lovely. We contemplated using this as Greta’s room, but the bedrooms downstairs are larger and have great closets so it made more sense to take advantage of those. Right next to the office and opposite the master is the staircase that leads to the lower level. We’ll share those photos soon. So much to do! Do you see the potential? « Our House: Where we Started and Now. The Great Room is Painted!!! Congrats. I especially love the front window for the Christmas tree. Can’t wait to see what you do with it! Do you plan to paint out your kitchen cabinetry again? So excited for this new journey!!! Congrats… can’t wait to see all the changes you will make over the coming weeks, months, and years. How exciting! So excited to see how you’ll transform the space. I just have to say I hate (HATE!) countertops with tiles (as in the kitchen). Who really wants to clean grout on the counters in their kitchen?! Not me. Great space! Can’t wait to see what you guys do with it! So much potential! Woohoo! Love all the potential. Love it! I bet all those painted walls caused people to overlook the greatness of the house. Which of course was great for you guys. There is a bunch of positive things I would love to make over myself!!! Oh snap! That’s a lot of house with a lot of potential. Can’t wait to see what you guys do with it! SO.MUCH.SPACE!!!!! Wow, I can’t wait to see how you make it your own – so much potential. Love it!!! Love it! So excited for you! It’s missing the obligatory Idaho barn red wall! Every house David and I have ever looked at in Idaho has at least one barn red wall (although one we saw was painted, through the ENTIRE HOUSE, all four walls in every room, barn red). He always laughs at how aggravated it gets me. It’s gorgeous, though! You must be reeling with all the possibilities. I’m excited to follow along! I just found your blog and love that I kind of get to start at the beginning of this new house with ya’ll. I love seeing people transform their space. It gives this not creative girl inspiration. Funny about the Christmas tree – Scott and I, as we sit under NO ceiling and studs for walls, constantly talk about where ours will go in a few months, too. Wow that’s a lot of house to clean. I am sure it will look different after you make it yours. Congrats. So much space! I know it will be fabulous when you get through with it! Can’t wait to see what you do! I’m in love with your squatty rambler! I see the potential!! Such great windows and natural light. I am so excited to see what you do with this space! It is going to be amazing. Congrats on the move. Can’t wait to see how you transform the space. I can see the potential. Wow! Very exciting! Love the house! ahh, love it so far!!! CANT WAIT TO SEE MORE!!!! I love that open layout!! And let’s play favorite part…that board and batten builtin tub, yum :) So many possibilities! Eeee!! Yeah, I see tons of potential! Congrats!